This is just a quick post to show off a piece that I recently finished using Miss Mustard Seed's Milk Paint in Luckett's Green. When I purchased this piece, it was covered in two different colors of spray paint. A bright blue was covered with black and then distressed with the blue showing through. Definitely not my style. I knew I wanted to try to stain the top if at all possible. My husband set to work trying to strip the old paint off with a heat gun. Usually the paint hardens and chips right off. This time it was a gummy, sticky mess. Yuck! 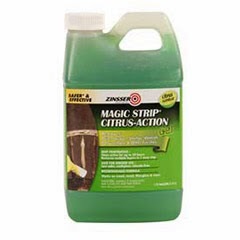 So we busted out the Zinsser Magic Strip Citrus Action. Hands-down the best stripper out there! I stained the top with Minwax Dark Walnut and finished it with several coats of wipe-on poly. 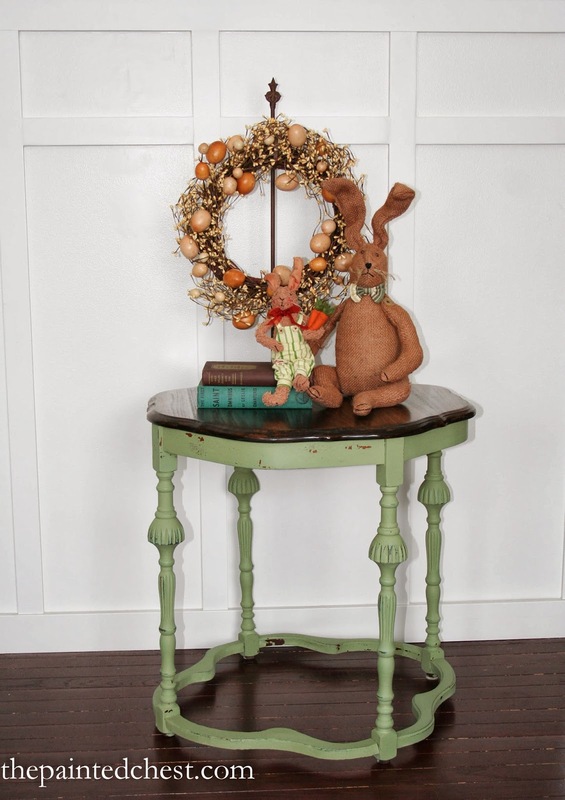 I painted the base of the table with Miss Mustard Seed's Milk Paint in Luckett's Green. I wanted this piece to have some natural distressing, so I did NOT use the bonding agent when I mixed it up. I finished it off with Miss Mustard Seed's Hemp Oil. Isn't this just a lovely color? It reminds me of Spring and we surely need a little Spring weather around here. Do you like a chippy, distressed look or do prefer a solid finish? Thank you, Angela! I typically do light distressing on most of my pieces whether I sell or keep. I was kind of hoping to see this piece chip a little more than it did. But that's the way it goes with Milk Paint, it's always a surprise! Thanks for stopping by!! Such a pretty color! I stick more to light distressing but have been dying to do a chippy piece with milk paint. I just know it's not going to come out the way I want it to. Milk Paint has a mind of its own! All you can do is give it a try. That's the nice thing about Milk Paint, all you have to do is paint over with a little bonding agent the next time. Love this stuff!